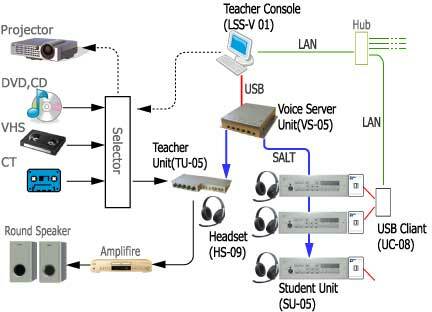 Listening Station is a language education system convenient and useful for any purposes and applications such as teacher-centered, individual or group learning. Using Listening Station, you can download any teaching materials from PCs just as easily as copying a 10-minute material only for 6 seconds. Both teachers and students can use the system at their command. You can also directly import sound from CDs, VTR and DVDs. Unlike the CALL system, learners do not need to use any PCs on Listening Station, which is an optimal system for listening and speaking exercises. Teachers can focus on providing listening lessons with speech materials without any complicated operations. The teachers accustomed to using the conventional language laboratory equipment can comfortably use the system, too. Teachers can use their own laptop PCs as their own consoles. Listening Station can be connected with an USB cable to the console. Teachers can review the attendance, data on the analyzer and drill recordings on Listening Station anytime. The materials that the teachers drafted and edited on their PCs can be imported and used on the system. Listening Station is a completely digitized and ultra-light system. Compared to the conventional tapeless language laboratory, our system is a half in weight, one-fifth in power consumption and one-fifth in the amount of cables. The footprint of the server relevant to the conventional console is as same as 7 x 10 inch paper. You can flexibly lay out Listening Station without desk exclusive for server. We provide customers a high-quality sound system in ultra-light and compact size by digitally processing sound and introducing multiplex transmission technology of digital sound (Smart Audio Link Technology). Copyright © 2018 Ampere All Rights Reserved.